Dev Update #47 - VRidge Controller and Tracking Update released! It is time! VRidge 2.3 is released. Thank you for your relentless testing and feedback. Now everyone will be able to have fun with our new tracking options. This update brings everything that was available on Beta channel to our live version. We also have an additional surprise for you. Earlier last week we have released a trailer video for our new product - VRidge Controller. 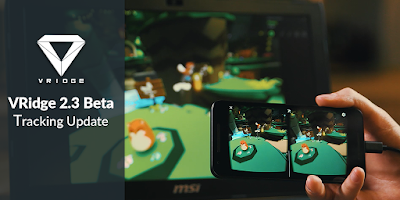 It’s an Android app that will let you turn your spare phone into a VR controller compatible with VRidge. You can use two phones to have full 3-DOF VR experience or pair it with Daydream/Oculus Go/HTC Vive Focus controller and use them together. Currently VRidge Controller is distributed through Google Play and is being priced at $5. We hope that this neat add-on will bring you a lot of joy in VR! With this update, our new movement model is also going live. 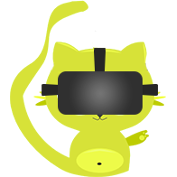 New integrations available in RiftCat will let you use Xbox controller or Mouse+Keyboard to move and control your hands in virtual reality. This feature should let you fully play VR games that do not require very fast and precise hand movements. It is a perfect addition to what VRidge has to offer and it is completely free. You can find this option integrations tab in RiftCat client. You can even pair these controls method with VRidge Controller app to create very interesting control schemes! Daydream All-in-One headsets like Lenovo Mirage Solo had limited support. The controller was working but the headset positional tracking system was not. 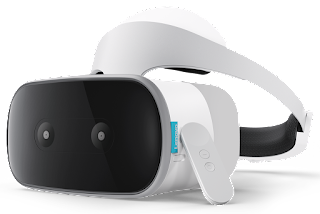 This update brings full support to Daydream WorldSense technology so anytime you use VRidge with device utilizing this tracking technology you will be able to freely move in a VR world! It’s not comfortable to constantly take off your headset whenever you want to look at your keyboard or monitor screen. This patch solves this problem if you have front facing camera! Double tap your phone screen or capacitive button of your headset. You can also use Gear VR touchpad to do it and if you prefer keyboard shortcut, simply press: CTRL + ALT + SHIFT + S to to check what’s in front of you through your device camera. Of course to use this option make sure that you have front facing camera on your VR device. If you are using phone inside a VR case, make sure that nothing is obscuring your phone camera view. If you have an AR Core support phone, you can try out an experimental feature to track your head position with it. This option is hidden in RiftCat/Config folder. Simply change “ArcoreTrackingEnabled” to “true” in VRidge.cfg file which can be opened in Notepad. We’ve made some changes to RiftCat GUI to make it more readable. Among various small convenience options like adding IPD / Scale slider values or creating an option to show login window on connection screen we have remade the integrations screen to be more descriptive. We also have new SteamVR icons for VRidge! As always, there is always something to improve with these translations so don’t hesitate to use CrowdIn to provide your feedback! We also received the last minute translations to Estonian language which is 100% complete. Unfortunately it missed the deployment window, but we’ll make sure to release it with the next update! We’re opening up a way for you to also remap your 3DOF DIY controllers in the same way as Gear VR / Go, Daydream or Vive Focus controllers are remapped. We also added additional access layer to simplify API usage. This is combined with a release of Java SDK which can be used by your Java or Android projects. Added VridgeRemote class as a fire-and-forget access layer to use API without managing connection state. Added a way to remap 3DOF controllers into 6DOF controllers, attached to head. Added HeadRelation which configures how the pose is affected by recenter calls. Default "Unrelated" should cover most cases. Added discovery UDP broadcast which lets you find active VRidge servers on the local network. Removed async offset's pitch and roll axes. Old calls will discard pitch and roll data and only use yaw offset. Discussion. When using reprojection-enabled device, rotational head tracking input will be discarded. External rotational data doesn't play well with devices expecting to use late reprojection based on their own sensor data. Controllers will now disappear after 5 seconds without new data. Deprecated OrientationMatrix as pose format. Added separate rotation quaternion and position vector instead. Removes ambiguity of pose matrix format and byte layout. Old format still works. C# API client now multi-targets .NET Standard 2.0 and .NET Framework 4.7. 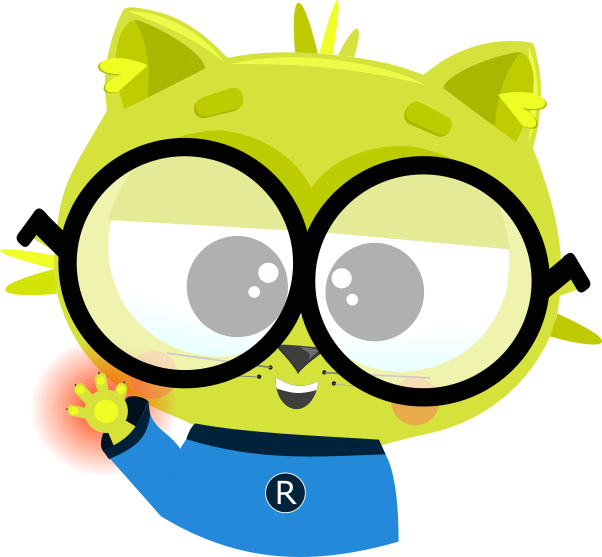 Go to our GitHub repo and explore changes for yourself! Changed how recenter hotkey works internally so it doesn’t conflict with API trackers and reprojection. Changed the way we calculate velocity of controller (throwing should work more reliable now). Controllers should be less jittery in most games. Updated Oculus SDK to 1.16. Updated PC app .NET to 4.7.1. You will be automatically prompted to update your .NET runtime if you disabled Windows Update. Whitelisted RTX cards for NVENC (GUI problem only). Blacklisted GTX 1030 from NVENC. It doesn’t have hardware encoder. SteamVR should now be closed in a nicer way by VRidge (trello card). Legacy oculus sdk games should now work properly on devices with reprojection. 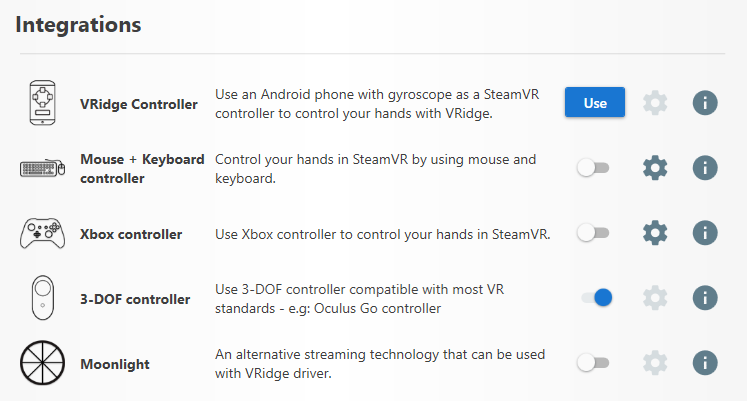 Added option to autostart SteamVR when mobile device connects to Vridge. Improved connection streaming stability, especially with high bitrates. Fixed Android’s VRidge lobby overlay becoming stuck in some cases. Fixed Daydream app not resuming properly on some devices. Fixed a crash related to missing DirectX components on Windows 7. It will now ask user to download missing DirectX update. Fixed rare Android networking native crash caused by race condition. Fixed gamepad recenter binding not being detected properly in Riftcat Config. Fixed Riftcat crash when Config subfolder was deleted by user if Riftcat was installed to Program Files. This update will ask for additional permissions on your Android device. It will ask for camera and bluetooth - we use these permissions to be able to work with AR Core and Finch controllers SDK. We do not use any of these permissions for anything else so you do not have to worry. We are now focusing on iOS development. It’s in advanced development stage so hopefully we’ll release it very soon! Also, there is Oculus Quest release coming up. We will make sure to be able to fully support it as soon as possible. 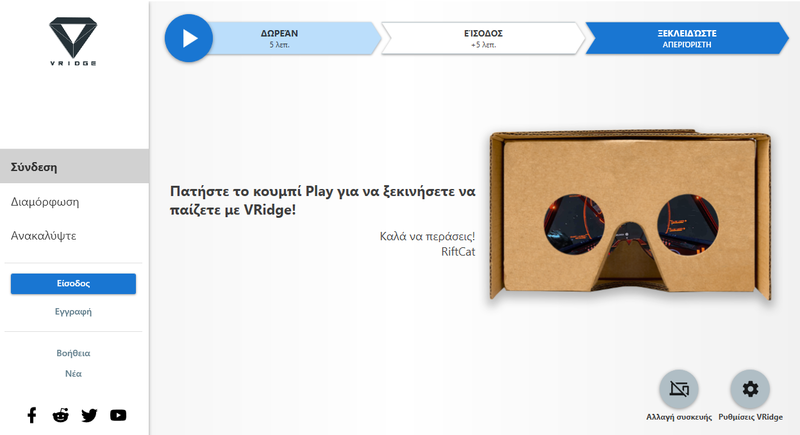 This update is a great step for RiftCat but giant leap for VR… or something among these lines. It’s definitely important milestone for us that will vastly increase VRidge possibilities. We hope that this update will bring you a lot of joy and fun in virtual reality. Don’t hesitate to share the news about the update on our social media and among your friends. The more people know about VRidge, the more VR players we’ll have to hang out with in virtual worlds. We have just released an update to our Beta channel. This version is a release candidate that will get pushed to stable update channel quite soon. Expect some good news to come! Added a "missing windows component" popup with a download link to fix one Win 7 crash. Added a way for emulated controllers to work in single-hand only mode (to be paired with 3DOF controller or other options). Added configurable System-press event delay for controller emulation. PC app will now ask for admin rights to fix itself if user deletes Config folder in Program Files. Fixed a crash happening on Mirage Solo during app pause & restart. Fixed Xbox-controller player's movement speed. Fixed API networking crash in PC app. Fixed native Enet networking crash in Android app. Fixed ARCore not starting when camera see-through was enabled. Improved error reporting in NVENC. Enjoy trying it out :) Let us know as soon as you will find any errors. Every piece of feedback is highly valuable! 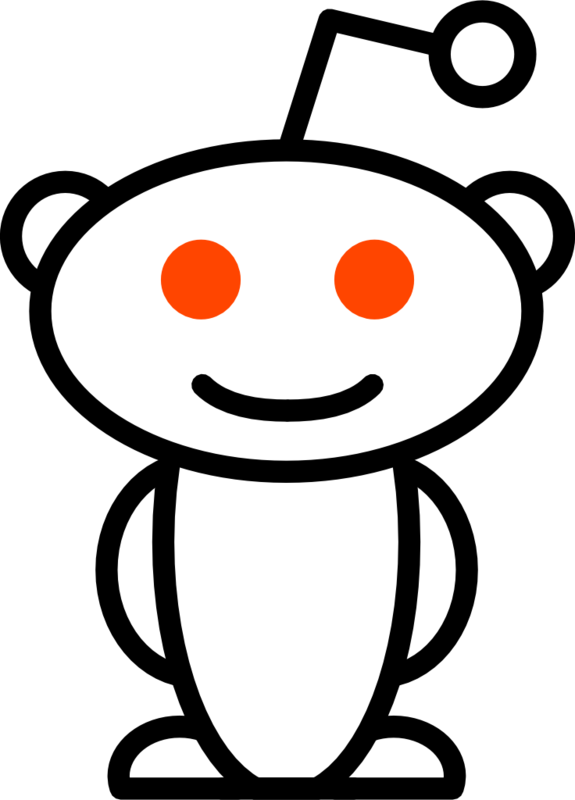 To learn how to try out the Beta version, simply follow this guide.